Bhopal: Ashfaque Mushhadi, Madhya Pradesh Special Correspondent of Rashtriya Urdu Sahara, will be honoured with national level Hakim Qamr-ul-Hasan award for Urdu journalists by the Madhya Pradesh Urdu Academy here on Thursday evening. Others to be felicitated with the national-level awards include: Zafar Sehbai for the Meer Taqi Meer Award, Qaiser Siddiqui for the Hamid Saeed Khan award, Ishrat Wahid for Shadan Indori Award and Mushtaq Waleed for the Johar Qureshi award. While those to be conferred State-level awards are: Shakeel Gwaliori for the Siraj Meer Khan Sehar award, Shan Fakhri for the Basit Bhopali award, Abdul Hai Anjum for the Mohamed Ali Taj award, Iqbal Girami for the Nawab Siddique Hasan Khan award, Farukh Anjum for the Sheri Bhopali award, Khalida Siddiqui for the Kaif Bhopali award, Om Prabhakar for the Sukhan award and Qazi Malik Naved for the Shifa Gwaliori award. The Madhya Pradesh Urdu Academy had announced the above national and State level awards for 2010-11 recently. The awards are conferred for commendable service provided to the Urdu language. According to Urdu Academy secretary Ms Nusrat Mehdi, the awardees would be provided cash awards, mementos and shawls at the award ceremony. The function would be presided over by noted poet Padamshree Dr. Basheer Badr, who is also chairman of the Urdu Academy while chief guest will be Member of Parliament Kailash Joshi. Ex-MP Kailash Sarang, BJP leader Rameshwar Sharma and Madhya Commissioner for Minority Welfare Raghuveer Shrivastav would guests of honour. Meanwhile, an All India Mushaira will also be held on the occasion after the awards presentation ceremony. The Mushaira will be compeered by poet Mansoor Usmani of Moradabad. 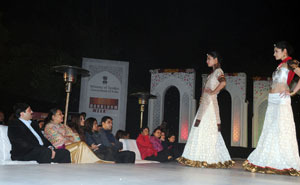 Union Minister for Textiles Dayanidhi Maran at the Handloom Fashion Show, in New Delhi on December 21, 2010. Secretary (Textiles), Mrs. Rita Menon is also seen. © 2010 Awaz Multimedia & Publications. All rights reserved.